But the reality is more complex than either of these stories. Very few people throughout the Middle Ages believed that the world was flat…Columbus could not have proved that the world was round, because this fact was already known. Nor was he a rebellious modern—he was a good Catholic and undertook his voyage believing he was doing God’s work. A transformation was taking place in fifteenth-century views of the earth, but it had more to do with a new way of mapping than with a move from flat earth to round sphere. Scholars in antiquity developed a very clear spherical model of the earth and the heavens. Every major Greek geographical thinker, including Aristotle (384–322 B.C. ), Eratosthenes (third century B.C. ), and Ptolemy (second century A.D.), based his geographical and astronomical work on the theory that the earth was a sphere. Likewise, all of the major Roman commentators, including Pliny the Elder (23–79 A.D.), Pomponius Mela (first century A.D.), and Macrobius (fourth century A.D.), agreed that the earth must be round. Their conclusions were in part philosophical—a spherical universe required a sphere in the middle—but were also based on mathematical and astronomical reasoning. Most famous was Aristotle’s proof of the sphericity of the earth, an argument used by many thinkers in the Middle Ages and Renaissance. If we examine the work of even early-medieval writers, we find that with few exceptions they held a spherical-earth theory. Among the early church fathers, Augustine (354–430), Jerome (d. 420), and Ambrose (d. 420) all agreed that the earth was a sphere. Only Lactantius (early fourth century) provided a dissenting opinion, but he rejected all pagan learning since it distracted people from their real work of achieving salvation. 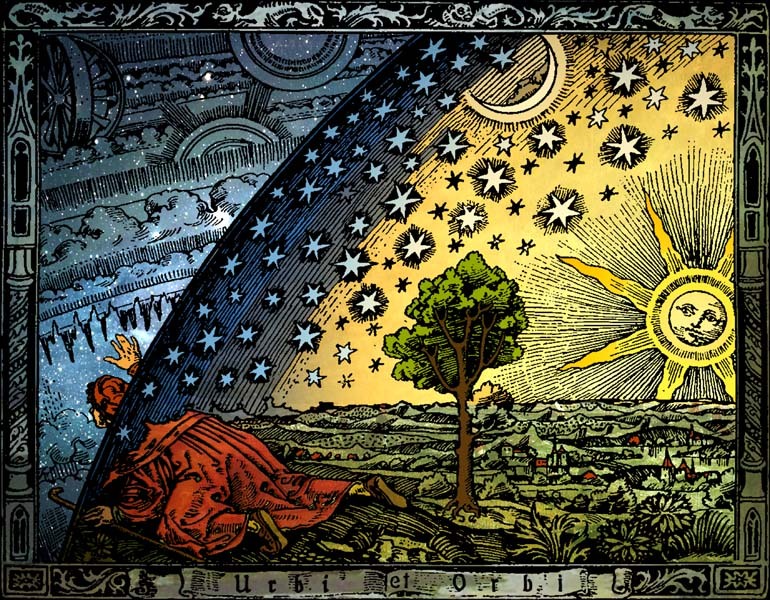 From the seventh century to the fourteenth, every important medieval thinker concerned about the natural world stated more or less explicitly that the world was a round globe, many of them incorporating Ptolemy’s astronomy and Aristotle’s physics into their work. Thomas Aquinas (d. 1274), for example, followed Aristotle’s proof in demonstrating that the changing positions of the constellations as one moved about on the earth’s surface indicated the spherical shape of the earth. Roger Bacon (d. 1294), in his Opus Maius (ca. 1270), stated that the world was round, that the southern antipodes were inhabited, and that the sun’s passage along the line of the ecliptic affected climates of different parts of the world. Albertus Magnus (d. 1280) agreed with Bacon’s findings, while Michael Scot (d. 1234) “compared the earth, surrounded by water, to the yolk of an egg and the spheres of the universe to the layers of an onion.” Perhaps the most influential were Jean de Sacrobosco, whose De Sphera (ca. 1230) demonstrated that the earth was a globe, and Pierre d’Ailly (1350–1410), archbishop of Cambrai, whose Imago Mundi (written in 1410) discussed the sphericity of the earth. Both of these books enjoyed great popularity; Sacrobosco’s book was used as a basic textbook throughout the Middle Ages, while d’Ailly’s book was read by early explorers like Columbus. And therefore I say sickerly that a man myght go all the world about, both above and beneath, and come again to his own country . . . And alway he should find men, lands, isles and cities and towns, as are in their countries. …Given this background, it would be silly to argue that Columbus proved the world was round—or even argued so. However, popular accounts continue to circulate the erroneous story that Columbus fought the prejudiced and ignorant scholars and clerics at Salamanca, the home of Spain’s leading university, before convincing Queen Isabella to let him try to prove his position. When Peter Martyr praised the achievements of Columbus in his laudatory preface to Decades of the New World (1511), he was quick to point out that Columbus had proven the equator was passable and that there were indeed peoples and lands in those parts of the globe once thought to have been covered with water. Nowhere, however, did he mention proving the sphericity of the earth. If Columbus had indeed proved the point to doubting scholars, Peter Martyr surely would have mentioned it. Those who want to preserve Columbus as an icon for the historic moment when the world became round might appeal to the common people. After all, weren’t Columbus’s sailors afraid of falling off the end of the earth? No, they weren’t. According to Columbus’s diary, the sailors had two specific complaints. First, they expressed concern that the voyage was taking longer than Columbus had promised. Second, they were frightened that, because the wind seemed to blow constantly due west, they would be unable to make the return voyage eastward. As we have seen, there is virtually no historical evidence to support the myth of a medieval flat earth. Christian clerics neither suppressed the truth nor stifled debate on this subject. A good son of the church who believed his work was revealing God’s plan, Columbus didn’t prove the earth was round—he stumbled on a continent that happened to be in his way. Source: Lesley B. Cormack, “Myth 3: That Medieval Christians Taught that the World Was Flat” in Ronald Numbers ed., Galileo Goes to Jail and Other Myths About Science and Religion (Harvard Uni. Press, 2009), pp. 28-34. Scholarly footnotes omitted in this post.